A beautiful and elegant flowering Carmona microphylla (Oriental Tea Tree) indoor bonsai gift with very pretty Hedgehog & Rose 'Happy Anniversary' foil balloon, drip tray, bonsai fertiliser and pruning scissors. An inspired wedding anniversary gift. Please add your personal message below. Next working day delivery is free to most areas or you can choose your delivery date at the checkout. 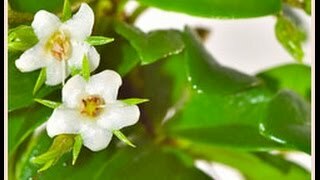 This bonsai displays small white flower, a lovely deep green glossy leaves. A beautiful wedding anniversary bonsai kit.